New York in 1901. With the flatlands of America largely claimed, it’s time to rethink how to live in this world. Up we’ll go, in structures of steel and glass that reach toward the sky! This is our chance at the American Dream, to prove ourselves as one of the great designers of a new metropolis. 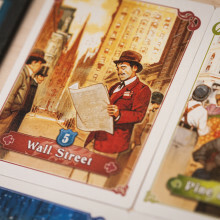 New York 1901, from designer Chenier La Salle and publisher Blue Orange Games, is a family-style area control game in which you and your competitors will work to develop plots of land in lower Manhattan, circa 1901. The city has yet to take its iconic shape and it’s up to you to do it better than the rest, building and rebuilding until your structures stand tallest along the city streets. To accomplish your end goal, you’ll navigate two separate, but similar, options on your turn. The first option is largely the crux of the entire game, and lets you choose from the four lot cards that are available each turn. 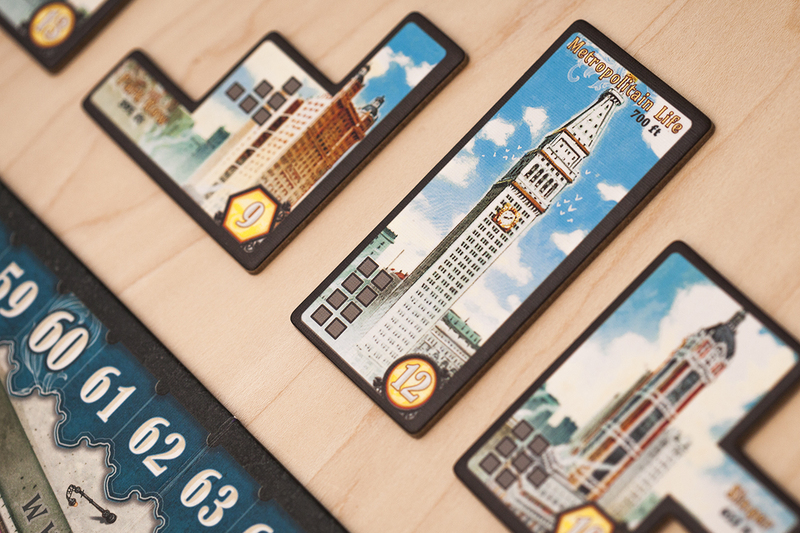 These cards come in one of five possible colors, representing the different districts of the city, and two possible sizes – consisting of either two or three spaces. By picking one of these lot cards, you will then claim a corresponding space on the city board and reserve it with one of your four worker miniatures. Once you’ve chosen a lot, you’ll be in sole possession of that land for the rest of the game. In addition to acquiring land, you may optionally build a single building on one (or more) of your previously claimed lots. Doing so immediately nets you points equal to the value of the building. You start the game only being able to build Bronze buildings, but as you score points, you’ll be able to upgrade to Silver and Gold buildings. Conversely, your other turn option is to demolish—remove one or more of your adjacent buildings from the board (and the game)—and build a new, more advanced building over top of those old structures (i.e. a Silver building in place of a Bronze building). 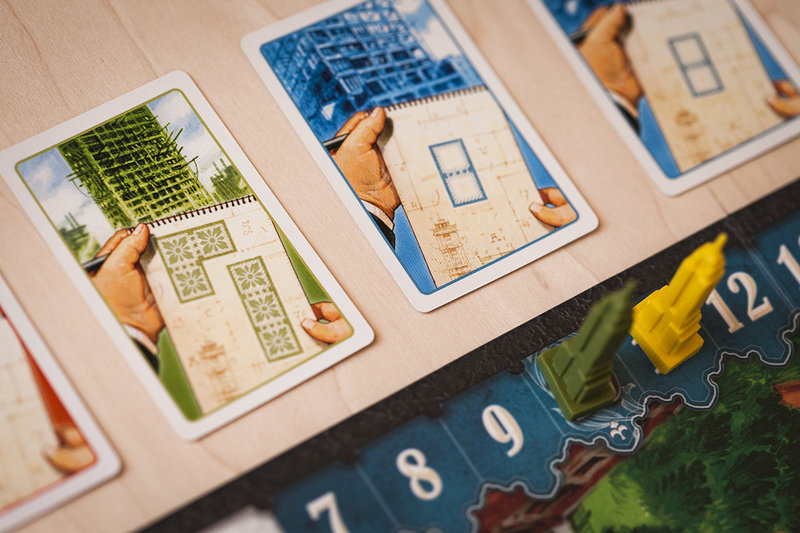 Similar to the initial buildings, you score the value of the new building and must use your miniatures to reclaim any previously owned lots that may have been left empty after the demolition. Fulfilling the requirements of the Bonus Challenge Card that was also chosen for this game. The player with the most points after these end-game scoring opportunities is declared the winner! 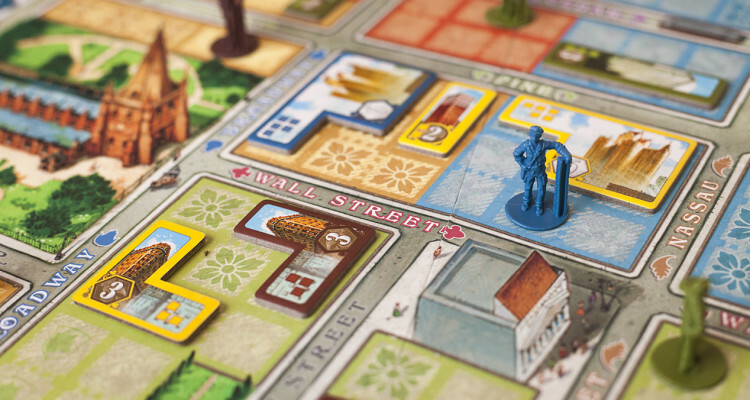 New York 1901 finds itself in an interesting position within the board gaming world. Publisher Blue Orange Games set out with the intention of tapping into a heavier market than they’re used to: family-style strategy games. For a company who makes the bulk of their revenue from children’s games and quirky one-mechanic fillers, New York 1901 is a surprising departure from their brand. That being said, it feels like a completely natural step. 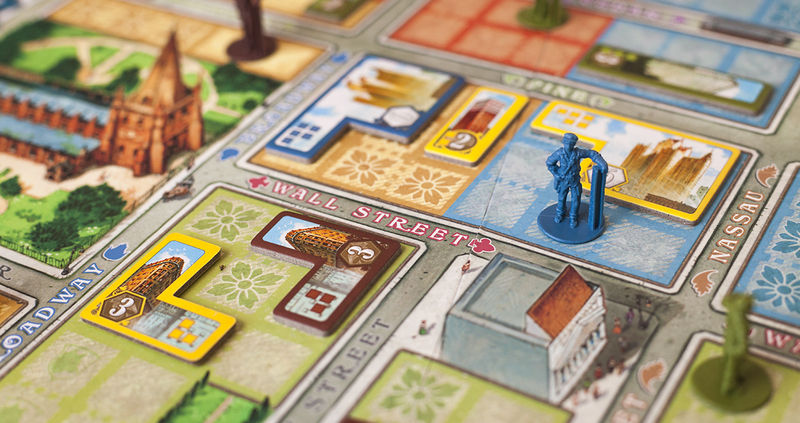 New York 1901 delivers the exact experience that Blue Orange Games prides itself on – a package of high quality components and approachable gameplay. Even better is that this addition successfully widens the scope of their offerings, as it is a terrific entry to the light strategy genre. 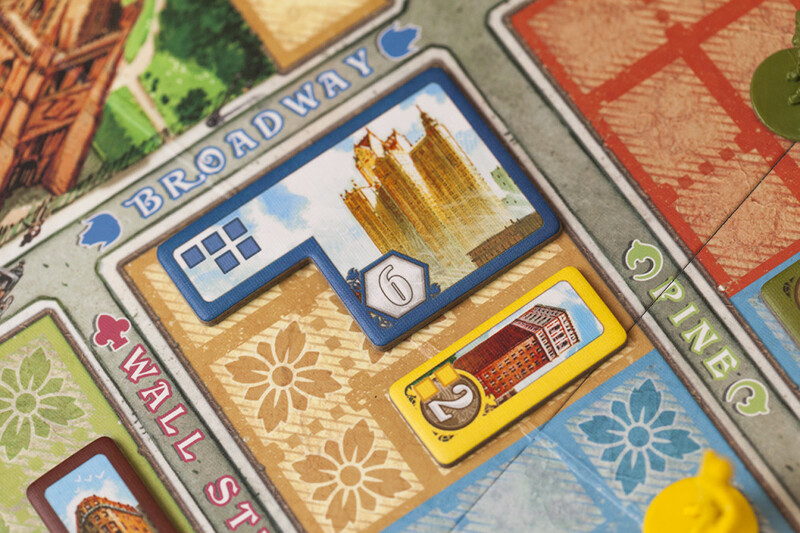 New York 1901 delivers a gameplay experience on-par with what the community is considering its biggest rival—Ticket to Ride. These two games are compared for obvious reasons: a) they seek to appeal to the same market base; b) they both utilize a combination of small but meaningful decisions turn-to-turn to work toward a larger end-goal; and c) they both foster light strategic and tactical decision making. While this review isn’t intended to be a Venn Diagram of these two games, New York 1901 draws so heavily from the successes of the Ticket to Ride formula – whether intentionally or not – that it is worth using as a basis for pitching the game. Where New York 1901 begins to separate itself is in the player interaction and variability between games. 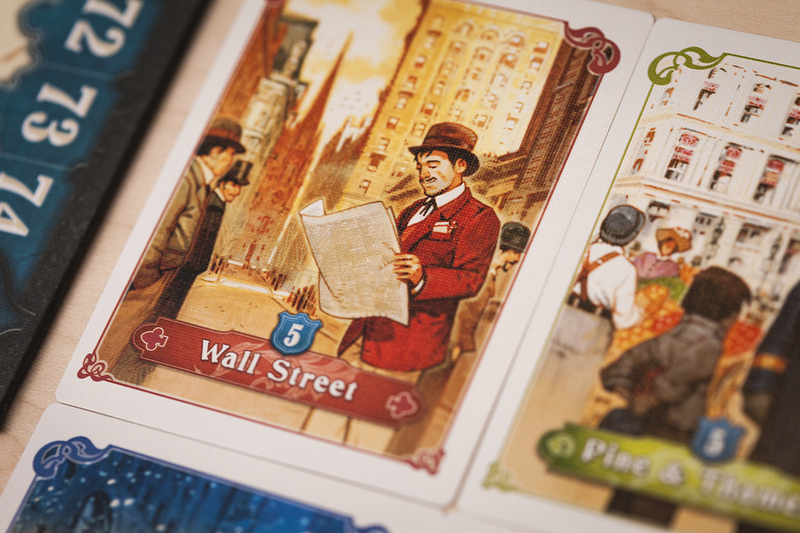 After playing the game a few times you’ll find that, while you still largely remain beholden to the card flip, there is a lot of room in New York 1901 to forge your own path. There are legitimate differences between spreading across the board, grabbing as many lots as possible, and simply refurbishing the same plot of smaller land again and again. The limitation of only having four worker miniatures to reserve lots means that proper management of this resource is often essential. Additionally, the three one-time-use bonus action cards provided to each player at the beginning of the game allow you to capitalize at opportune times by grabbing a second lot or building twice in one turn. These meaningful decisions are made so because of the interaction found throughout the game. The randomly available lot cards and street majority end-game bonuses create tension for all of the players as the city grows congested quickly. Trying to build some of your bigger buildings can be difficult even when ignoring the high likelihood that an opponent’s worker will spring up right in the middle of that Wall Street block you were monopolizing. It’s not always malicious, but it is always restrictive and it will be up to you to maximize the opportunities that are available during your turn. From a family perspective, I don’t find a lot wrong with New York 1901. 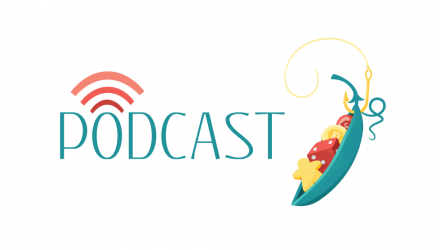 It is simple to teach and play, lasting only about 60 minutes, and provides enough variability in terms of scoring challenges to keep the experience fresh while you attempt to solve the basic puzzle of the game. As a more experienced and “heavy” gamer, though, there are a few chinks in the armor. The three-space lot cards are a strong option and typically worth putting a plan on hold to grab, for your benefit and to deny your opponents. Also, the addition of the “advanced mode,” which increases the scoring threshold needed to build Silver and Gold-level buildings, largely provides no change to the way you approach the game. It would have been more appreciated if the mechanisms were altered in a way that introduced complexity, rather than simply forcing you to do more of the same. All that aside, New York 1901 seems to meet its purpose. 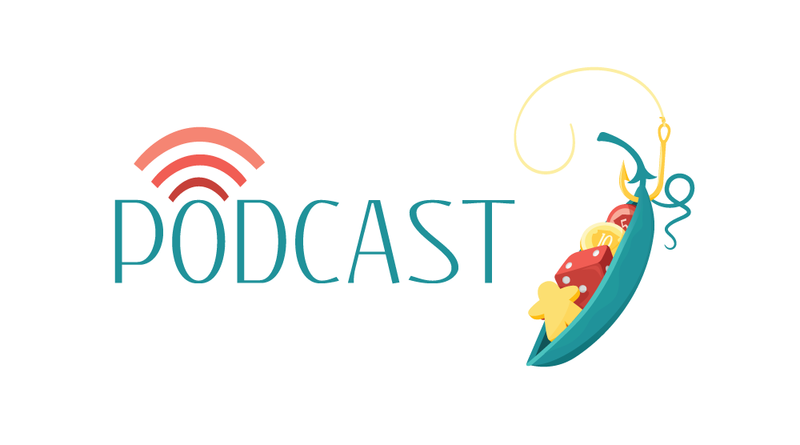 It provides legitimate fun for a lighter, more family-centered game group and does so with a high level of polish – both in the design and the production. 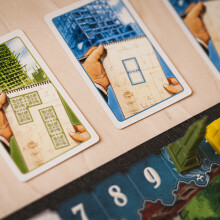 We’ll leave it up to you to decide if it’s a Ticket to Ride killer, but if you have an affinity for construction or the early 1900’s, this is the one to bring to the table. I love Ticket to Ride, and who doesn’t? When I was introduced to New York 1901, it was with a comparison between the two, and I have to admit I was skeptical: why would I play a game that’s like Ticket to Ride when I could just play Ticket to Ride? New York 1901 is a bit tougher, that’s why. It takes a little bit of spatial reasoning to ensure that you’re taking good lots and choosing appropriate buildings to fill them. It also takes a little bit more forethought because you have to consider what level of building you’re placing in a lot so that you can still ensure that demolition and rebuilding are a possibility later on. This is vital as rebuilding is how you continue to score when the board is filling up—and oh, how it fills right up. New York 1901 is as interactive between players as you make it: everyone can choose to stay in their own little corner and gather up whole lots, or you can throw your workers smack dab in an opponent’s district and give them a “sorry, not sorry,” shrug as you screw up the plans for that giant building you knew they had. New York 1901 is a great lighter game to throw in the mix on your game night, especially if you’re trying to incorporate newer gamers! New York 1901 is an excellent game to introduce and transition the family, or non-gamers, to a more strategy-based style of game. The production quality is second to none and Vincent Dutrait has once again graced our tabletop with his stellar illustrations. 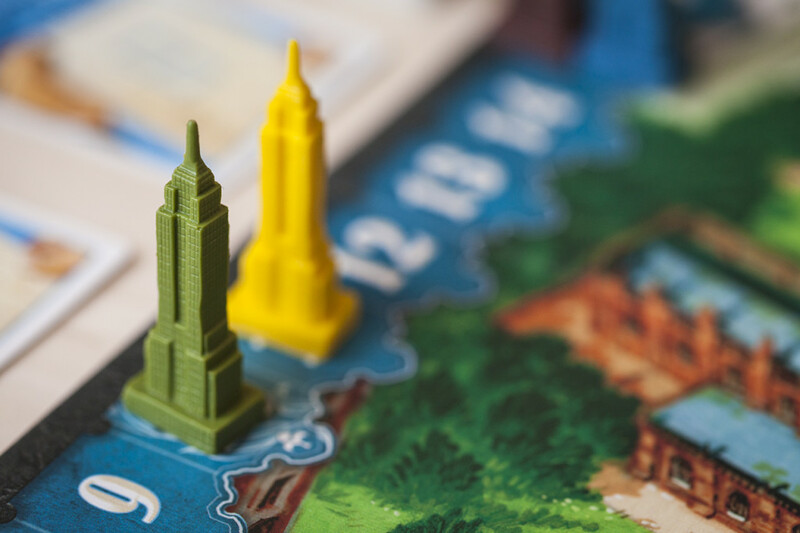 Mechanically speaking, New York 1901 fits precisely in line with the philosophy of Blue Orange Games—an engaging game that is simple to learn and teach. There is a very small learning curve in understanding how lot and building construction works, but it’s otherwise extremely smooth. 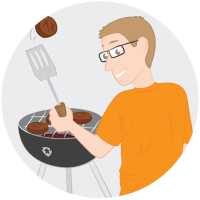 There are a number of things to consider on your turn through these simple mechanics. 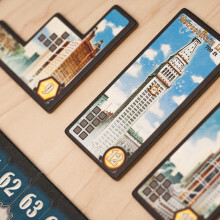 The shape of the building, the colored area and/or street, majority bonuses, the challenge card and even the potential to later build the large “communal” skyscrapers are all things to keep in mind. My favorite aspect of the game is aligning your buildings and lots so that you can re-build on top of them, giving new life to some of your original territory while still retaining the initial VP scored. This requires a bit of foresight to spatially map out your construction areas to accommodate future plans. Just remember not to lose sight of the majority and challenge bonuses because often these can make the difference at the end. If I had to mention a negative for the game it would be that the randomness of the card draw can be frustrating as it largely dictates what you can and cannot do on your turn. 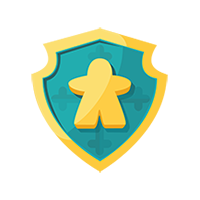 This is mitigated slightly by providing each player with one-time bonus cards that allow you to break the normal rules of the game (i.e. draw two cards, building two buildings). Even still, many turns may provide suboptimal or moot choices based on the cards you have drawn. Learning how to tactically cope with this is required in order for you to come out on top. New York 1901 is a beautiful, fun and engaging production which certainly sets the bar high for any future strategy game that Blue Orange Games releases in the future. I highly recommend you stick it on your shelf!